Being banned to stay off the water due to flu and cold I have to concentrate on different activities. I spent a great weekend with my friends in Melbourne, and on Sunday we drove to the Brisbane Ranges National Park. We hoped to see koalas on the Anakie Gorge Walk. Many of the eucalyptus trees were black from a fire not too long ago, with new branches and leafs blocking the views to higher regions of the trees. 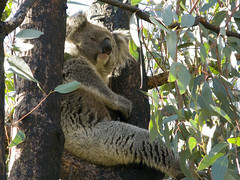 We were already on the way back when we finally discovered a drowsy koala just next to the walking track. This entry was posted on August 5, 2008 at 6:02 pm and is filed under Canon G9, Nature. You can follow any responses to this entry through the RSS 2.0 feed. You can leave a response, or trackback from your own site.